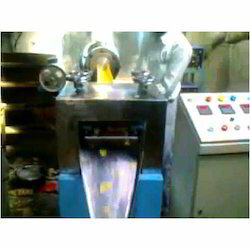 We are a leading Manufacturer of triangle bingo type snacks making machine from Noida, India. We are the foremost company for providing Triangle Bingo Type Snacks Making Machineto our valued clients. These are designed and manufactured by a team of well skilled and highly experienced professionals of industry using modern tools in following with the set industrial norms for quality. Our offered products are widely applicable in various sectors. These are available with us in various specifications. These products are made from best grade raw material.